Colombo's bazaar district, Pettah, presents a real treat for shopaholics who can wander through the hustle and bustle of whole streets dedicated to selling a particular type of merchandise, from local handicrafts to fresh produce. The markets will not be to everybody's taste; Pettah is a sensory overload and the sheer quantity of merchandise, and crowds of people, make it difficult to find good quality items. 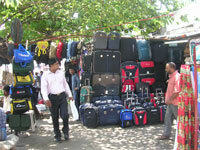 Bargaining is essential as foreigners tend to be overcharged. The quoted price will be at least double what locals would be expected to pay. The area was once an exclusive residential area filled with stately homes and large gardens in gas-lit streets. A relic of the colonial era, the Dutch House Museum, is open to the public on Prince Street. The mansion house dates from the 17th century and was the residence of Count August Carl Van Ranzow. It has now been restored and stands among the traders and boutiques as a museum displaying the life and times of the Dutch occupation, its exhibits including furniture, ceramics, coins and all the trappings of daily life at the time. Another landmark is the Jami Ul Alfar Mosque, one of the oldest mosques in Colombo.